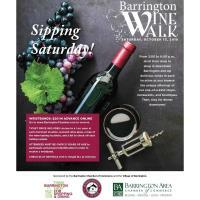 The Fall Barrington Wine Walk, sponsored by The Barrington Area Chamber of Commerce and the Village of Barrington, will take place on Saturday, October 13 from 2:00 – 6:00 p.m. Attendees are invited to enjoy a “Sipping Saturday” while visiting many unique stores in downtown Barrington and enjoying great wine provided by participating merchants. Check-in begins at 2:00 p.m. at NeoTeca, Inc. 130 S. Hough St. in Barrington. Tickets are $20 and can be purchased in advance online at www.barringtonchamber.com. Ticket price includes: access to a 1-oz. pour at each merchant location, souvenir wine glass, a map of the wine-tasting locations, and a list to check off each tasting sample. Attendees must be over 21 years of age to participate and present identification in order to receive a wristband. A trolley will be provided to transport Wine Walk attendees throughout the downtown Barrington area. Merchants participating in the Barrington Fall Wine Walk include: Anderson's Candy Shop, Angelina, Barrington Fine Rug Gallery, Barrington Flower Shop, Barrington Saddlery, Big Iron Horse BBQ/Cooper's Pizza, Colored Squid Gallery & Gift Shop, 18/8 Fine Men's Salons – Barrington, Estate Jewelers LTD, EWELINEB Fashion, Fancy Art, N.F.P., Flesk Brewing Co., Fleur De Lis Salon, Heinen's Grocery Store, Jewel-Osco, Long & Co. Jewelers, McGonigal's Pub, Neoteca Inc., Norton's U.S.A., Notice, One Girl, Paris Market Antiques, Savvy Spirit Women's Clothing and Accessories, Shakou Barrington, Skin Wellness by Renee, Studio 4 Hair Salon, Tootsies Shoes, Trevor James Salon and Vin Chicago. For more information call (847) 381-2525 or visit the BACC website at www.BarringtonChamber.com.